It’s Ramadan. How ’bout those Muslim women? In honor of Ramadan (which began this week ), and the fact that I have but a little time left with the lovely folks of Feministe, I thought I would aim once again for the overlap in my life’s Venn Diagram. Boom! Right there in the middle, where you would find the book I blogged about on Tuesday, Teta, Mother and Me, you will also find this: Paradise Beneath Her Feet: How Women Are Transforming the Middle East, by Isobel Coleman, senior fellow at the Council on Foreign Affairs (which I first reviewed when it came out in 2009). The public discourse among non-Muslims regarding the Muslim community tends to be shaped by stereotypes, possibly most powerfully when the conversation turns to Muslim women — they are hounded, we tend to think, and quite possibly cowering. 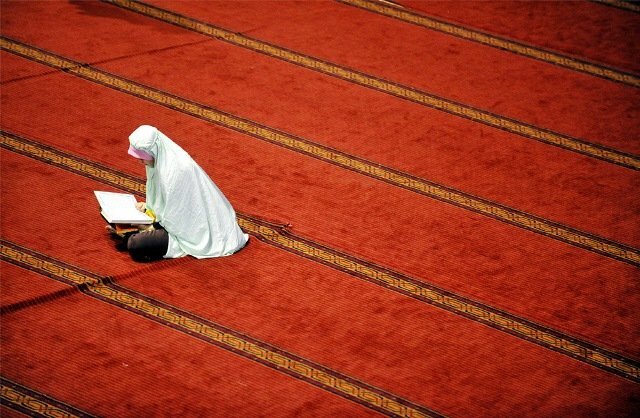 The very real problems with which Muslim women grapple appear rooted in the nature of the religion, and, we assume, are thus powerfully immune to real change. By way of counterargument, Paradise Beneath Her Feet presents an engrossing, seemingly counter-intuitive take on the question of women’s advancement in the Muslim world, showing that Islamic feminists are successfully arguing – from within the texts and traditions of their faith – that gross gender inequality flies in the face not just of the spirit of Islam, but also its laws. Opening with a global examination of the dilatory consequences of gender discrimination – higher infant mortality, lower incomes, even lower agricultural output – Coleman then takes an exhaustive look at the “gender jihad” under way across Iraq, Iran, Afghanistan, Saudi Arabia, Pakistan and Indonesia (an indication, in fact, of the inaccuracy of the title — this is not so much “how women are transforming the Middle East” as it is “how women are transforming the Muslim world”). Over the years, the shape of the effort has changed, as Muslim feminists learn from the mistakes of the 20th century — efforts to impose change from above (anti-veiling laws, for instance) are now understood to have “sow[ed] the seeds for decades worth of Islamic backlash,” ultimately setting women back as they struggle to move forward. Today, Coleman argues, those engaged in the jihad for Muslim women’s rights are trying to work “with the culture, rather than against it,” frequently succeeding where few thought it possible, as they attempt to build “a legitimate Islamic alternative to the current repressive system.” Her findings reflect the countless interviews she’s conducted, with activists who’ve been fighting for decades alongside those born in the meantime, as well as years of comprehensive research. She doesn’t attempt to paint a rosy picture — the challenges are real, and they are immense — but Coleman does present a convincing argument that Muslim feminists have the potential to shape the future of Islam. The BBC has great background information on Islam (and all kinds of things, really!) on their website, covering all the bases in brief articles — here’s the one about veiling (hijab). Muslims respond to extremism – a brief compendium that I put together, with links to more information if you want to go deeper. A short list of Muslim American heroes that I compiled in response to the wave of Islamophobia that has swept the US in recent years. To learn more about Ramadan, click on the links at the top of the post. They’ll bring you to the BBC & a great, brief video by The Guardian (check out the Indonesian drummers!). Crossposted at Angry Black Lady Chronicles and Feministe. Things about me which please me (and even occasionally make me proud). Very brief Sunday brief: The protests in Israel. This is not related to this specific post. I was not sure where I could write to you. I love your blog and your writing. I have found it surprising that you have not written about the social protest happening now it Israel. Although it is, in theory, about social issues, it goes much further and is truly the first optimistic moment for many of us around here in a long time. Yesterday, nearly 400,000 people protested around the country. 400,000. This is unprecedented. People are fed up with the government. People are aware that even if some say it is not a political protest, it is. I think that if you were here, you would be moved. I’m glad you got in touch! You can always send an email to the address on the About page. I have, actually, been following the protests quite closely and tweeting a lot about them, I just haven’t had a chance to write about it, between a guest stint at Feministe these past two weeks and then being on vacation since mid-last week (which is why you had to wait since yesterday for your comment to appear – I haven’t been online almost at all for several days!). I’m planning on writing about the protests this week, Monday or Tuesday. Thank you for coming by to see what I had to say, and for encouraging me to take the topic on! Emily, I had to write and thank you for your recommendation of Coleman’s “Paradise Beneath Her Feet.” I have learned so much from this and am telling my friends they have to read it. It’s been a great resource and provides introductions to brave men and women who are battling for women’s rights. Thank you, thank you for the recommendation.